You still picking your feet in Poughkeepsie? What is it about 101 Films and New York? Of the 44 films we have discussed, 7 of them, 16%, have been New York based. What does this mean? That New York is our spiritual home and that we should definitely record our 101st podcast there? Yes, lets say that. Lewis, pack your bags! Anyway, this week we visit the wintery and gritty 1970s New York of The French Connection . 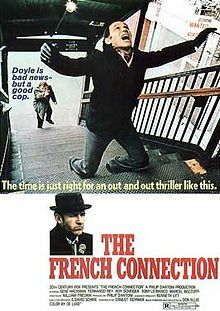 A film neither Lewis or I had seen, The French Connection was recommended to us by listener/reader (I can never remember what we call you) Claire Curie. Lewis and I both very much enjoyed the film. In particular we liked the way that, although a thriller, it does a great job depicting the more procedual side of police detective work; mostly the waiting. Yes, as a detective you might get the chance to indulge in an exciting car chase through Manhattan or rough up a perp while dressed as Santa, but that’s about 5% of your job. The rest is sitting in cars, waiting for stuff to happen. We also both developed a definite man crush on Gene Hackman. His portrayal of Detective “Popeye” Doyle manages to walk the line between making him someone you can root for but not shying away from what a pretty horrible person he can be. Its a fantastic performance which well deserves the Oscar he got for it. Other than jabbering on about Gene (*sigh*) there’s the usual nonsense as always. We shoot ourselves in the foot AGAIN by choosing another rival film podcast as our Secret Sponsor – The Projection Booth Podcast. The worst thing is they seem much more professional than us. What are we doing?! Still, they’re this week’s Secret Sponsor so we are honour-bound to recommend that you check them out. Please don’t leave us for them though!